You will be able to Learn top OxygenOS 9 Hidden features, Tips, and Tricks That Make OnePlus Phones Stand Out. That You Must Check Out. Today we are here with Detail guide on OxygenOS 9. As we all know, it’s not the hardware specs alone that define a phone. The software also plays an important role in making it a complete experience. Why should you buy the new OnePlus 6T? OnePlus has released a new version of the Oxygen OS with the release of its latest flagship, OnePlus 6T. There are lots of new additions to the latest version which you might not notice. So here is a list of all the tips and tricks of the Oxygen OS 9 you should know of, to make your OnePlus 6T run smoother for longer. App locker secures your data-sensitive apps from prying eyes. You have to use a PIN or the fingerprint scanner to open an app, which means only you can use it. The feature can be enabled for every app on your device. To set it up, go to Settings > Security & lock screen > App locker and type in your PIN code. Then just tap the “Add apps” option and choose the apps you want to lock. The feature also lets you hide notification content for an extra layer of security. We know that OnePlus has reduced the size of the notch to an extreme extent but still, it is a notch, and everyone (including me) wants to get rid of it. OnePlus included a feature to do that, just go to Settings > Display > Notch > enable Hide the notch option. OxygenOS comes with a set of nifty gestures that let you perform certain actions with ease. The three-finger swipe down gesture to take a screenshot is an elegant solution to the default way of taking a screenshot, and you can also control music playback and launch apps with gestures. One of my favorites is the gesture that lets you take a photo by long pressing on the camera sensor. It comes in handy if you tend to take self-portraits with the rear camera. Starting this year, OxygenOS picked up navigation gestures that are akin to what you’d find on the iPhone X. The gestures allow you to get rid of the navigation bar — freeing up screen real estate — and offer a more intuitive way of navigating the interface. OnePlus 6T vs OnePlus 6 performance: Which one is fast? This is an interesting feature not just when playing games, but also when using any app that needs your complete attention. You can enable it by going to Settings > Advanced > Gaming Do Not Disturb. This mode prevents any app notifications from popping up, but allows calls and alarms to go through. Next, the capacitive buttons at the bottom of the screen also are disabled. This is useful when you’re playing a game or watching a video with the phone held sideways, so there’s no chance of accidentally hitting those keys. So, if the keys don’t work, how does one exit the app? Simple: by swiping down twice on the notification drawer and turning it off first. Shelf is a productivity tool on your home screen. It shows the current weather, lets you create notes, and offers quick access to recent contacts and apps. There’s also a “Dashboard” feature available, which shows your phone’s available storage, the current battery percentage, and how much data you have left in a given billing cycle. Shelf is customizable, but only to a point. You can add in widgets from any app you have installed on your device and delete the ones you don’t care about. You can also edit notes, although this feature wasn’t available from the very beginning. You can’t choose which contacts it shows, as Shelf only lists the last five to ten you’ve called. Reading Mode made its debut last year with the OnePlus 5, and is one of my favorite features on OxygenOS. Like Night Mode, the feature automatically calibrates the color temperature of the display, making it conducive to reading. Instead of switching to warmer colors, Reading Mode creates a monochrome effect that’s great for reading text. You can activate the mode manually or set it to automatically launch for specific apps. For instance, if you have the Kindle app installed on your OnePlus 6, you can enable Reading Mode to launch automatically whenever you open the app, leaving the rest of the user interface unchanged. The OTG feature on any smartphone let you connect a USB drive directly to your phone to transfer data. Sometimes you can use it to connect a USB keyboard or a mouse to make the work even easier. Keeping this option on for long may drain your battery when your phone is not connected to an OTG device. You can disable it in Settings > System > OTG Storage and save some battery. This feature comes in most of the smartphones including Oppo and Vivo which let you use two accounts for the same app like WhatsApp or Facebook. You can do this in OnePlus 6T too, go to Settings > Tools and Utilities > Parallel apps. The Alert Slider has been a mainstay on OnePlus devices since the OnePlus 2, and this year the feature is getting an update that makes it easier to use. With the OnePlus 6, you can use the Alert Slider to toggle between ring, vibrate, and silent modes, with DND getting its own set of options. During the OnePlus 6 launch, the company announced that it would add the ability to schedule Do Not Disturb mode, and OxygenOS 5.1.6 adds an option to do just that. You’ll finally be able to set up custom rules for Do Not Disturb, and configure a preset time so it kicks in automatically — no more toggling the Alert Slider every night. OnePlus introduced Face Unlock late last year, and it’s safe to say that the manufacturer’s implementation is one of the fastest around. The face unlock feature relies on over 100 data points to verify your facial features, and while the feature isn’t as secure as the fingerprint sensor — OnePlus says as such while you’re setting it up — it is a convenient way to unlock your phone. The Lift-up display gives you easy access to the clock and time widgets, as well as incoming notifications. You’ll be able to choose from several clock faces, and set a display message on the screen. There’s also the option to wake the screen for new notifications, and you can invoke the “Ok Google” hotword to launch Assistant even when the screen is off. To start Setting<Display< Ambient Display. Oxygen OS 9 on OnePlus 6T comes with a feature to change the icon theme all around the user interface. You can change the icon theme by taping and holding the home page and select settings. Then you will see the Icon theme option from there you can change the theme and you can download more from the Google Play Store. The Oxygen OS comes with a dark mode which enables dark theme all around the user interface and stock apps like contacts and dialer. You can enable it by going to Settings > Display > Theme > Dark theme. OnePlus is working on a new feature called Smart Boost which launches apps faster than any other smartphone with Snapdragon 845 processor. It does it by loading some of the frequently used apps in the background and keeping it in the RAM. You can enable it from the OnePlus Labs in Settings > Utilities > OnePlus Labs > Smart Boost. Since Google announced a new feature called Night Sight with some extraordinary capacity to take bright pictures in low light conditions. Every other smartphone brand is working on an exact feature, OnePlus has Night Scape. You can take bright images in low light conditions, just launch the camera app and switch to Night Scape mode and click the picture. 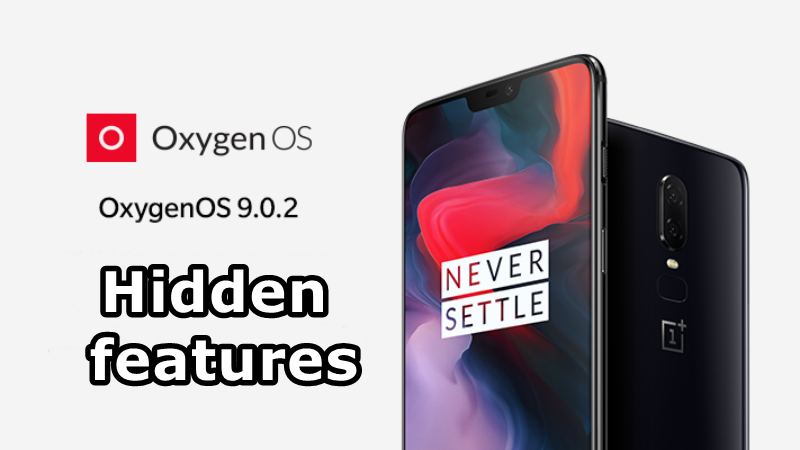 I hope you understand all article on OxygenOS 9 Hidden features, Tips and Tricks That Make OnePlus Phones Stand Out. If you have any problem then ask in the comment box. We can solve your problem.